Geisinger and Merck have collaborated on a pair of new web-based applications, designed to make it easier to incorporate patient data into health systems' electronic health records for better care coordination, treatment and outcomes. One app, called Family Caregiver, enables two-way communications between patients and their care teams. The other, known as MedTrue, draws together medication data from different sources to help patients with reconciliation and adherence, creating a meds list that's vetted by both patient and provider. Both apps, which use SMART on FHIR specifications to incorporate data from disparate EHRs, are accessible to patients and also embed their information within providers' EHR workflows, bringing patient-reported data to the point of care. Both were also tested in clinical settings at Geisinger. "Providing these tools for patients and family caregivers – tested within our own system – enables patients to be more active in healthcare decisions and could increase the likelihood that patients will adhere to their treatment plans and lead healthier lives," said Geisinger Chief Scientific Officer David Ledbetter. The Family Caregiver application enables a calendar to meld medical and personal appointments for better care coordination, and offers a patient-managed medication scheduler based on daily activities. It gives patients information on their health care team members (specific roles, contact numbers) and offers a journal-like feature to jot notes and create narrative dialogue for patient encounters. The app, which was first piloted for oncology but is designed to work for other areas requiring complex care coordination, "enables our team to create a more personalized experience with each patient during a very difficult time," said Rajiv Panikkar, MD, chair of the Geisinger Cancer Institute. It can help with "planning treatment appointments around important personal upcoming events and answer medical questions that the patient or caregiver may otherwise forget to ask during a scheduled appointment," he said. The MedTrue app, meanwhile, includes medication fill data from a prescription data aggregator irrespective of care setting. It uses a web-based interface for patient-reported verification, changes and adherence data, making that info accessible at home or at the health system. 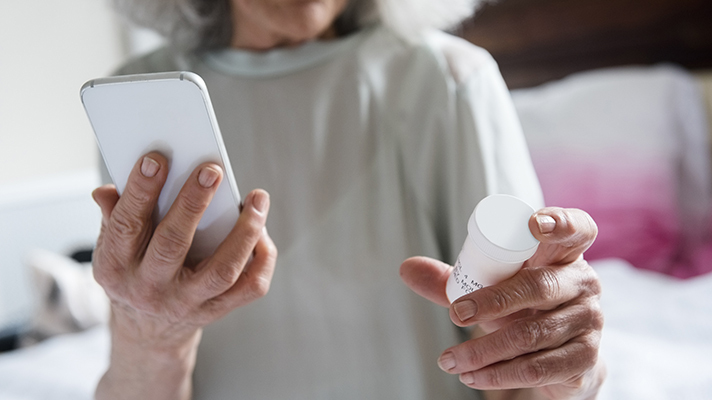 Caregivers can see the data within the EHR, gaining visibility into the patient's own validated meds list and help with medication nonadherence, which is a major hurdle to better population health. "We know from prior work that about 70 percent of our medication lists are inaccurate, and these inaccuracies can lead to medical errors," said Mike Evans, Geisinger's chief pharmacy officer. "The MedTrue application provides an interface that seeks to clean up medication lists, so patients and providers can be on the same page regarding medication use and better care decisions can be made."